Antonijuan, J.; Simarro, G.; Guillén, J.; Nogueras, M.; Manuel, A.; Palanques Monteys, Albert; Puig, P.
Antonijuan, J. [et al.]. 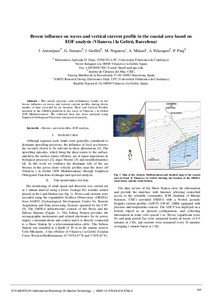 Breeze influence on waves and vertical current profile in the coastal area based on EOF analysis (Vilanova i la Geltrú, Barcelona). A: International Workshop on Marine Technology. "MARTECH 2013". Girona: 2013, p. 140-143.